Join the discussion on our forums! Come discuss Luckydo Buccaneer over in our dedicated Luckydo Buccaneer discussion topic. Has anyone tried this out in a Kingsbane deck? I know it goes against what Kingsbane decks are usually going for, but I think it could be an interesting card to play around with. A 6 mana (conditional) 9/9 os nothing to scoff at, and it only takes one Deadly Poison to activate it. I feel like Phantom Freebooter is just better. Buccaneer, Deadly Poison, Naga Corsair, Southsea Squidface , Captain Greenskin, Assassin's Blade . Tinker's Sharpsword Oil for those in wild. WOuld. 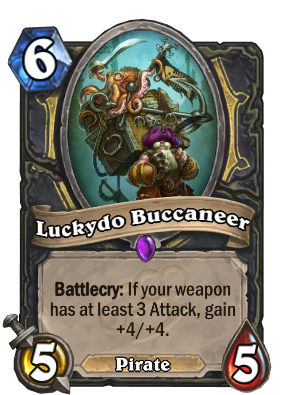 Be if they had released a good weapon or weapon buff card. I was hoping to see a Jade Lotus grummle, I just didn't expect it to be (potentially) the biggest pirate to date. well now that you mention it, that blade does have a quite a curve to it! Damn...play this thing with Assassin's Blade on the turn before-or even a normal dagger with Deadly Poison-and your opponent better have some kind of hard removal or else they're screwed. Really good in Arena and has potential in constructed. I hope when you play this card it says "Whats your luckydo?"